Lockrite Security install a varied range of audio and video intercom systems for home and business customers throughout Hampshire, Surrey and Berkshire. We can install audio-only or audio and video intercoms to your home or business property. The intercom allows two-way voice communication through the panel and you can see the visitor using the built-in camera. A door entry system can be combined with access control keypads or proximity readers as an additional unit or as one unit. How do Door Intercom Systems Work? 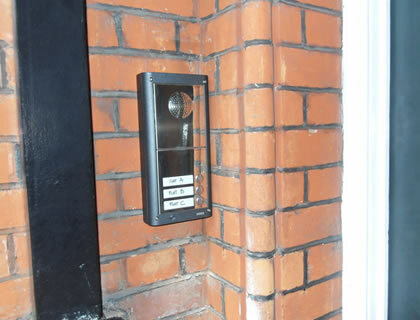 An audio door entry system provide a lower level of access control as there is no camera to verify the visitor. 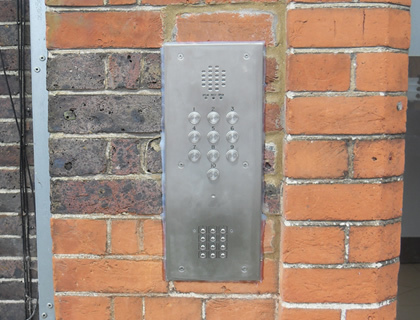 Audio intercom systems are typically found in flats, communal buildings and business premises. The visitor presses a button to activate the intercom – you can talk with the visitor before allowing access to the building. The door can then be opened from inside the property, allowing access to the visitor.